Inevitably as the new year rolls around, many of us begin to embark on new health resolutions — some are attempting to go from couch to 5k (or more), some might be cutting unhealthy processed foods from their routines, while some may be trying to incorporate more of a plant-based diet throughout the week. 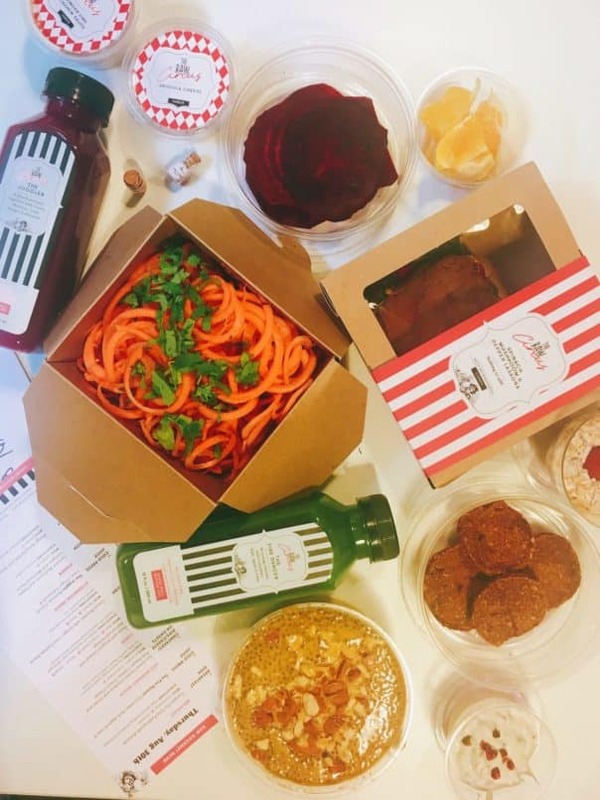 One easy way to inject a veggie detox in our lives is by signing up with The Raw Circus — a raw vegan meal plan company launched last year. The company was founded by brand agency owner Jenny Tan, who first saw the health benefits of going raw vegan when her mother recovered from cancer by simply changing her way of eating. Burnt out by her work in South Africa in 2017, she underwent a week-long raw vegan cleanse with the help of her mother and enjoyed the newfound energy that resulted from clean eating. But realising the time commitment it took to prepare the dishes (“it was like a full time job,” Tan says), she and her business partner saw an opportunity to help prepare larger batches of healthy raw vegan meals for all, and The Raw Circus was born. We recently put one of their three-day meal plans to the test; read on for our full review. What’s the deal with raw vegan food? We can all agree on how “rabbit food” is healthy for us, but there’s still the general impression that vegan meals can get a little staid and joyless — many friends and colleagues replied in response to my raw vegan diet trial with variations of “why are you doing that to yourself?” I saw only good in trying to eat clean plant-based meals for a period of time, and I happily found that eating raw food isn’t necessarily just carrot sticks and salads. Obviously, heat is the enemy. Advocates of raw veganism say the true benefits of a raw vegan diet lies in the nutrient density of uncooked and unprocessed foods. Heat also destroys enzymes. You have digestive enzymes in your body, but proponents of a raw vegan diet argue that enzymes already found in your food deactivate at temperatures as low as 47°C, hence, requiring more of your own body’s enzymes to digest these foods. This purportedly puts more stress and eventual inflammation in your body, and can even lead to enzyme deficiency (there’s a lack of scientific proof for this, though). By going raw, it’s rather difficult to incorporate animal products in your meals (though some people also eat raw fish or raw dairy). 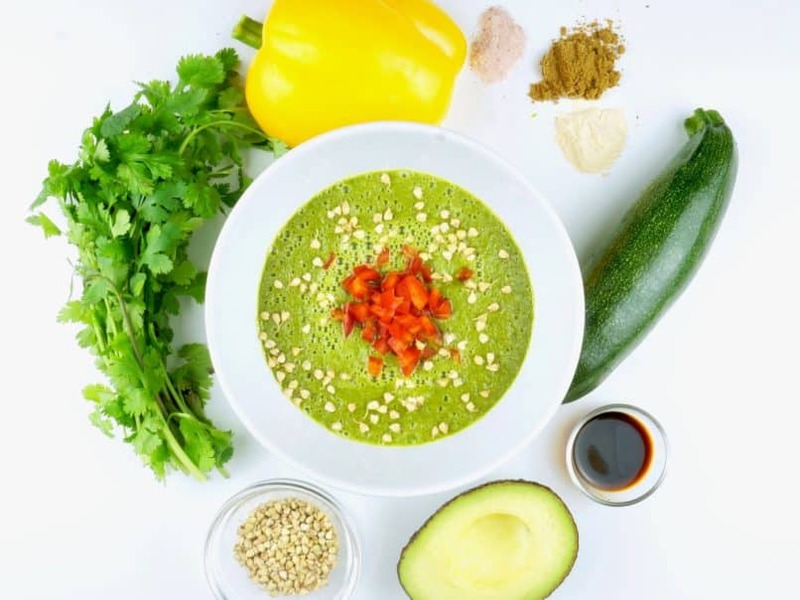 Without being able to heat food, raw vegan recipes tend to rely on a lot of clever preparation methods to gain flavour and texture as well as to maximise nutrition — for instance, through blending nuts and seeds, fruits and vegetables for creamy sauces and soups. 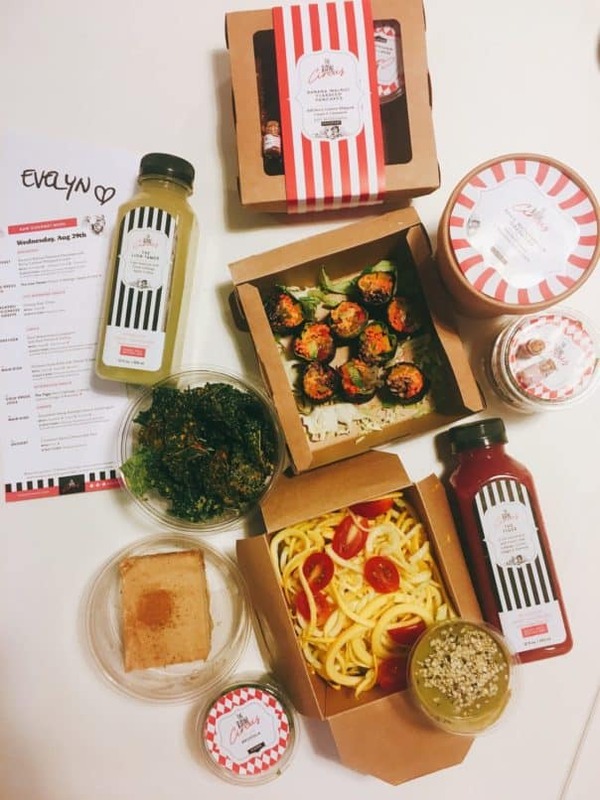 With over 250 new recipes and counting since its launch last year, The Raw Circus tries to use a majority of organic and seasonal produce. It offers three meal plan options: Raw Gourmet plan, the Detox/Weight Control plan, or Stay Fit plan. 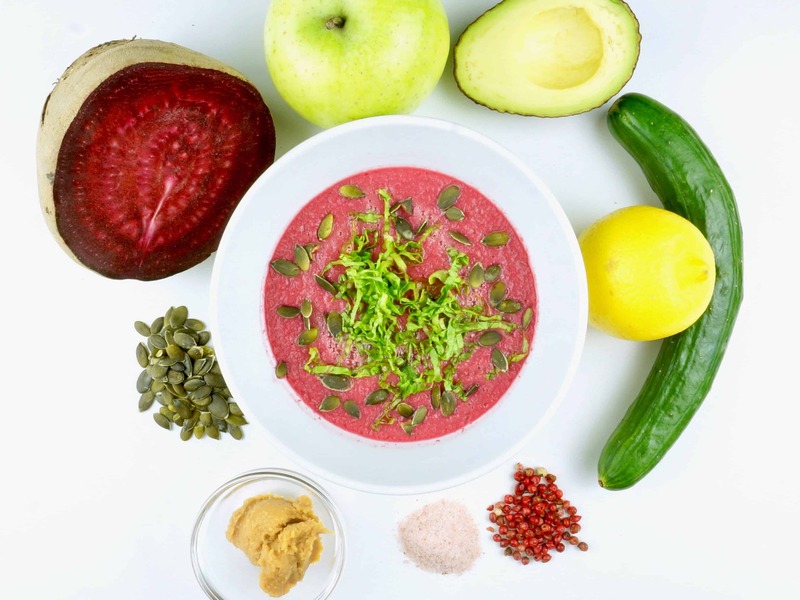 The Raw Gourmet plan (HK$520/day for the three-day plan; HK$495/day for the five-day plan) is tailored for food lovers who want to sample all that raw veganism has to offer, with three full meals, a snack and a dessert in between, plus two cold-pressed juices daily. The Detox/Weight Control plan (HK$490/day for the three-day plan; HK$465/day for the five-day plan) is for sluggish individuals who want to revitalise their bodies with a low GI diet plan that will help keep your energy sustained and your insulin levels at bay (essential for shedding weight). Good news for keto diet stans, or those intrigued by the high fat, low carb eating regime: this one is 100% keto-friendly. It’s on the light side, helping to flush toxins with detox cold-pressed juices, infused waters, pure coconut oil and protein-rich sprouted grains (as opposed to eating grains as is, sprouting is said to help release vitamins and make proteins more bioavailable to the body). There’s only one main dish per day. The Stay Fit plan (HK$395/day for the three-day plan; HK$375/day for the five-day plan) is sort of like the Goldilocks plan: where you can enjoy the health benefits of the meal plan but don’t need to strictly eat raw vegan for the duration. Soon, there will also be the Get Strong plan, aimed at gym-goers who want more protein, and more carbs in the morning to sustain energy as they start their day. 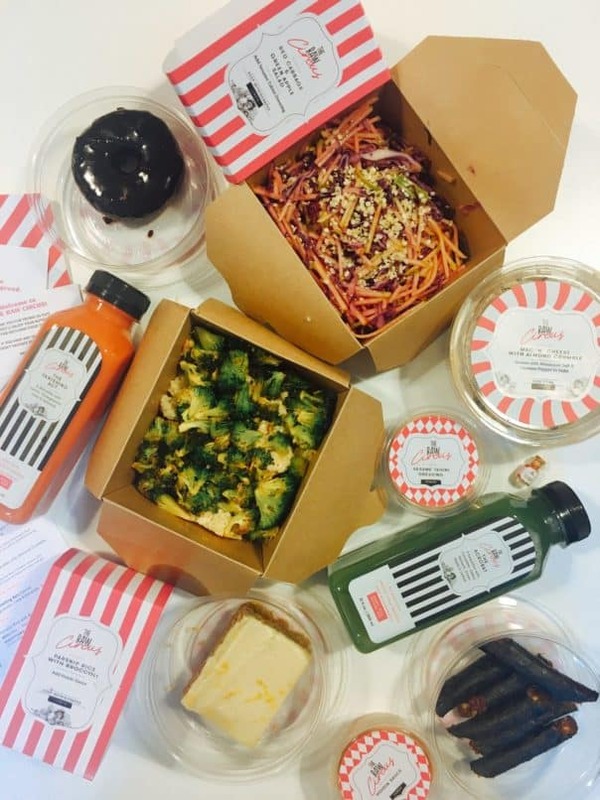 There is also a lunch option for single and multiple days or the entire week where you can mix and match your order, which includes a starter, main, snack, dessert and an infused water and/or cold-pressed juice. You can order for yourself or with a group, with free delivery in select buildings in Wong Chuk Hang and Kennedy Town, or a minimum order of HK$200 with a HK$40 delivery fee. Orders are cut off by 6pm two days before you want your lunch delivered. Day one of The Raw Circus raw gourmet plan. Breakfast was an almond walnut chocolate doughnut with ganache frosting: Way to tempt us! I couldn’t believe I was having a chocolate doughnut for breakfast, and it was shockingly delicious, if slightly on the sweet side. 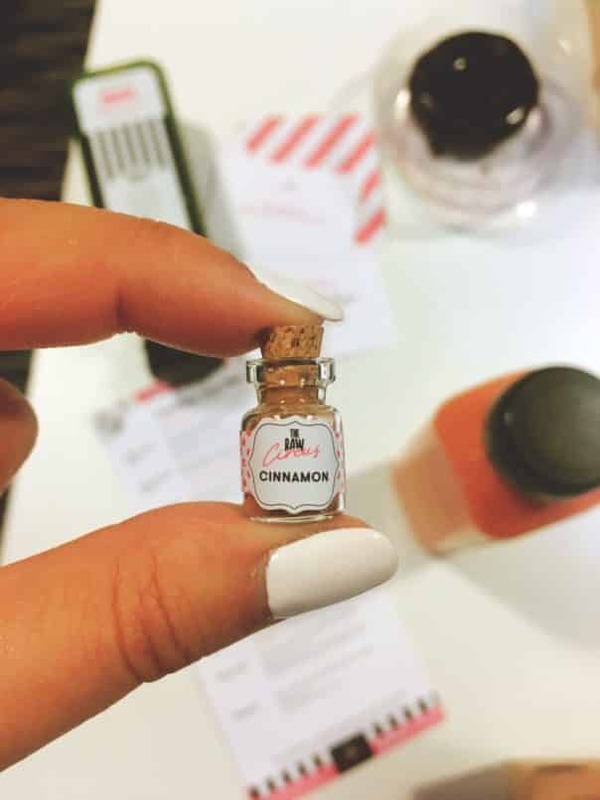 It was served with a tiny glass vial of cinnamon powder that you could sprinkle on top. It tasted like a fudge-dipped Christmas pudding. I enjoyed the texture of the doughnut — not something you can pick up and bite per se, but a cakey, fudgey dessert with a sticky date and crushed almond consistency. This was paired with The Acrobat — a peppy and refreshing juice of cucumber, celery, apple, spinach and lemon. Not even an hour later and it was time for my late morning snack: a box of chewy smoky jerky sticks — the raw vegan answer to SlimJims, I suppose? These were packed with savoury umami flavour, with a nutty filling wrapped in nori. Lunch was a delicious red cabbage and green apple salad, which helped cut the unctuous creaminess of the sweet sesame tahini dressing that accompanied. The second course was a “mac ‘n’ cheese” noodles with almond crumble. The zucchini “noodles” (zoodles?) were wet and soggy by the time I opened my lunchbox, and the cheesiness came from nutritional yeast, which gave off a tangy, yogurty flavour that I did not enjoy. Luckily, the salad already kept me quite full so I gave most of this a pass. I had an afternoon juice to drink, despite not feeling hungry or craving any sugar or snacks whatsoever. The dishes I had so far had left a sugary aftertaste in my mouth, so The Vanishing Act — a refreshing carrot, pomegranate, lime and almond juice — helped to quench the thirst. I moved on instead to the dessert, which felt like I was cheating somehow. Despite being full already, the apple walnut cake with lemon frosting was heavenly, though I couldn’t help imagining how much better it would taste warm. Day two of The Raw Circus raw gourmet plan. My breakfast was banana walnut flaxseed pancakes (pictured below) — a riff on British flapjacks in my opinion — with a crazy-indulgent berry cashew whipped cream (which tasted like real whipped cream, if a little flat). Again I could sprinkle more cinnamon on top with a new vial of spice. The seeds helped to balance out the sweetness of the dish. This was paired with The Lion Tamer juice: green cabbage, apple and lime. Considerably less indulgent than the previous day which I enjoyed. The crispy, cheesy kale chips for my morning snack were absolutely addictive, I had to get all my skeptical colleagues to try them, who gave me wide-eyed nods of approval. Lunch started with a basil watermelon gazpacho with red onions and celery. I don’t typically enjoy my soups cold, and this one tasted like watermelon juice with an astringent tinge of onion and basil. I didn’t not like it, but it felt more like a palate cleanser. All the better for me to enjoy the “Vushi” rolls, or gorgeous vegetarian rolls, which were mainly carrots and cucumbers cutely rolled with thick nori. Dipped in tamari (a fuller-bodied soy sauce for dipping) and spicy mustard, they were excellent veggie substitutes that can satisfy any sushi craving. My afternoon drink was The Tiger, a slightly spicy juice of red cabbage, carrot, lemon, ginger and almonds. Dinner consisted of “squashetti”, with hemp avocado sauce and arugula. The yellow squash noodles were stiff and cold, and I didn’t particularly enjoy the rather flavourless avocado sauce which had turned a shade of burlap sack by dinnertime (everything I ate except for snacks was religiously refrigerated). I looked forward to dessert, which was a cinnamon spice cheesecake tart. It reminded me slightly of a creamier pumpkin pie, and I happily inhaled it, though feeling a tad guilty at the number of sweets I’ve been consuming on this meal plan. Day three of The Raw Circus raw gourmet plan. For the third and final breakfast, I had actual pumpkin pie: no kidding, it was Pumpkin Pie chia pudding with almonds. Tasting the healthiest and lightest out of all three days, it lacked the richness and creaminess pumpkin pie is supposed to have — but it got me through my morning. I sipped The Fire Dancer — cucumber, kale, apple and lime — to wash it down. I really liked the morning snack, a fancy recipe that I’d like to replicate on my own somehow for when friends come over: sun-dried tomato crackers with onion paired with pink peppercorn cashew cream cheese as a dip. My small complaint is that the crackers weren’t crispy enough, especially after being packaged with chilled food during delivery. Lunch started with a beet salad with “arugula cheese,” walnuts and orange, a very refreshing and a nicely balanced dish. For the third day in a row, I was pretty much too full for the second course: today it was carrot noodles with a ginger-lime cashew sauce. These flavours were repeated with The Juggler, my ruby-red afternoon juice of beetroot, carrot, lime, ginger and almonds, though I am a fan of beetroot and I drank this right up. For dinner, I finally had the dish I was looking forward to the most when looking at the weekly menus online: Spinach Mushroom and Pepper Lasagna with Marinara sauce. This raw lasagna was everything I hoped for: thanks to some vegan wizardry it even had a “cheesy” browned crust on top similar to real Italian lasagna, and the umami of the mushroom blended with tomato sauce came through wonderfully. The only drawback was having to eat it stone-cold. The final swan song of my three-day raw vegan romp was a mango berry parfait with shaved coconut. Creamy, light and not too sweet, it was a great way to end a bout of supposed detox (it certainly didn’t really feel like it!). My main takeaway from going raw vegan for three days was that it’s a misconception you have to eat meat to feel full. Growing up in carnivorous Hong Kong, you often forget that, and I enjoyed getting reacquainted with a vast array of vegetables and not getting bored or hungry. I still prefer eating meat, but I’ve also consciously and comfortably eased into meals completely centred on vegetables without feeling FOMO. I enjoyed the majority of dishes I got to try, with the raw lasagna and breakfast chocolate doughnut being my favourites. I also loved the juices, which kept my appetite going and staved any cravings for soda or alcohol. I also managed to get very regular when it came to my bathroom habits, a great sign of detox, but perhaps it takes more than three days’ worth of food to do a full overhaul. I felt wonderful after the three days, maybe enhanced by the little letters of encouraging messages that came personalised with my name on the envelope with every delivery. I don’t have a big sweet tooth, and although The Raw Circus doesn’t prepare foods with any processed sugar, the prevalence of fruits and items using ingredients such as dates or blended nut milks and creams often left a sugary taste in my mouth. I felt that dishes were very flavourful and indulgent, which made the experience feel not quite like a detox at all, which was a plus. On some cases, I felt that some dishes were even a little too savoury, where sometimes I would prefer to taste the real flavour of the vegetables rather than mask it behind a recipe or a sauce. While the whimsical circus-themed packaging made the meals more something to look forward to (and more Insta-worthy), I wasn’t pleased with the amount of packaging being used. While The Raw Circus uses VegWare and compostable containers, without proper composting facilities these do not decompose as quickly as intended. Almost everything had printed sticker labels, which are not recyclable either. The tiny glass bottles of spices are adorable, and while not the most efficient, I still keep them for whenever I bring a desk lunch. I am, however, informed there is a Zero Waste Option where The Raw Circus will deliver in reusable containers and collect them (emptied, cleaned) at the end of the week — for an additional HK$150 fee and HK$50 returnable deposit per day of your chosen plan. The feeling I got from a raw vegan diet was a sustained feeling of lightness and energy even between meals, rather than the lethargy you typically get with a big bowl of pasta or rice and a lot of meat. I felt light on my feet and not as bloated as I normally would, perhaps on account of all the extra liquids and water I was consuming. 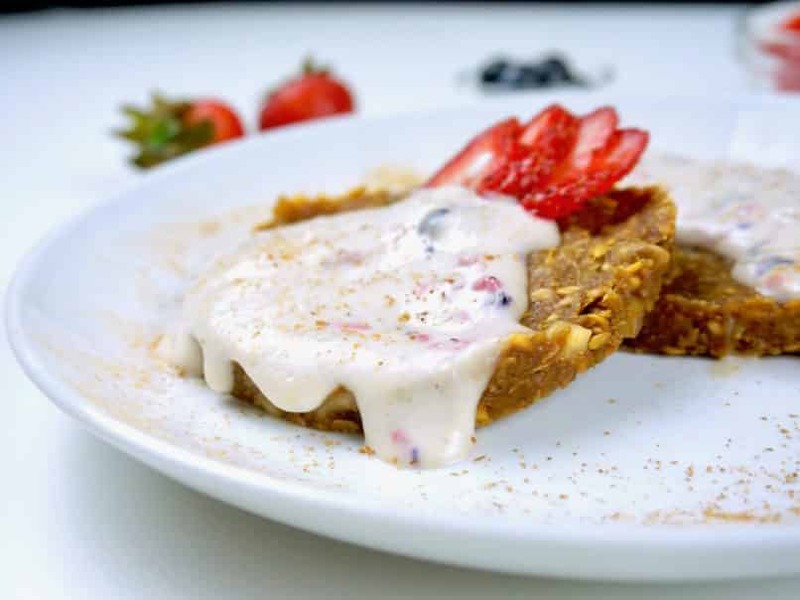 The Raw Circus’ plans are on the slightly pricey side compared to other healthy meal plans that are not raw vegan. 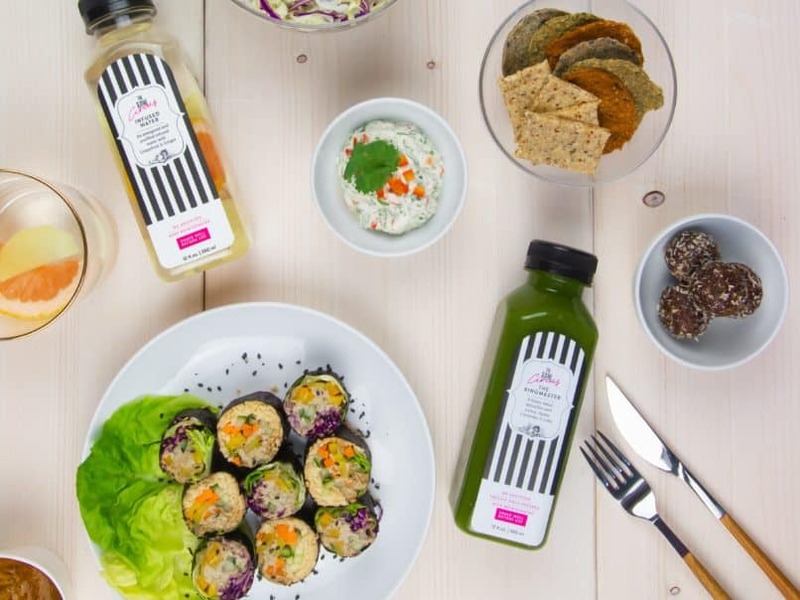 A popular non-raw vegan brand Nutrition Kitchen, for instance, starts at about HK$830-1,635 for a five-day package whereas the Raw Circus’ plans are priced at HK$1,875-2,500 for the five-day package. For numbers crunchers who are following a macro proportion diet, The Raw Circus might be difficult to manage as well, simply as they don’t offer nutritional information — or at least not the kind that most are used to. Whatever your stance is, you can’t doubt that you’re definitely getting a concentrated dose of a wide variety of nutrients by following the Raw Circus meal plan. In between the inevitable late dinners that come with working in a city like Hong Kong and a lifestyle of excessive boozing and/or feeding on the weekends; a raw vegan detox is certainly a good change of pace and a welcome reminder to bring more fibre and complex carbohydrates back into our diets. As always, healthy balance is key. Find out more at The Raw Circus.